It serves no purpose for those who say they were long into Agnes Varda before she was popular save to massage their pretentious little egos. That being said, I was WAY into Agnes Varda before all y’all. She was 90 years old, so her passing is like that of any extremely old relative — sad but not unexpected. Why is she such a big deal? The fact that she won general acceptance without trashing her integrity made her unique. She remained herself, despite the tendency of media to neutralize her outrageous independence as cute and winsome. For many she was just a tiny little troll lady who made quirky, inoffensive films. But her work was not cute. She was by far the most subversive of directors. First of all, she was just a good filmmaker. She could make great narrative films (‘Cleo from 5 to 7,’ ‘One Sings, the Other Doesn’t,’ ‘Vagabond’) and great documentaries (‘Black Panthers,’ ‘Uncle Yanco’). She is lauded as the Mother and Grandmother of New Wave cinema. She was cited as a leading Second Wave feminist, a thinker and a writer on gender and society. It’s a topic she treats directly, and that permeates her work as a filmmaker. How could it not? However, she went far, far beyond that in her films that are called documentaries but aren’t (‘The Gleaners and I,’ ‘Daguerrotypes,’ ‘The Beaches of Agnes’). This is the work she did that was really life-changing for me as a viewer and as a writer. She would focus on a subject and, basically, look into it with her camera. (This got easier for her as filming gear got smaller and lighter, less obtrusive.) At times you felt she was spying on reality. She could capture a world, a scene, a vibe. She could insert observations, confessions, admissions of a lack of understanding. She could use film like an instrument with many components, constructing meaning and argument with the ease of a magician. That approach reads like a blueprint for self-indulgent disaster, and in the hands of many it is. 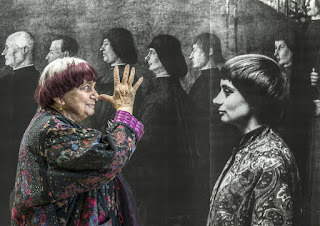 Varda’s gift was her intelligence and honesty. She would never take the easy way out. She would let her own ambiguities into the film, so that we could see and factor in her viewpoint, even her bias. Her subjective honesty is revolutionary for me. It allows the author to investigate, to feel, to think, to get all that in front of people, to get them to see freshly. Varda shows you how to do it. If you follow her lead, you find how stony and narrow this path is. She had heart. Not sentimentality, but heart in the true sense of inciting and sharing her passionate, compassionate truths. She could listen with her camera, the hardest thing of all. The impulse of anyone who wields a camera is to say what they have to say. Varda lets the camera follow, sits quietly in the corner, breathes. The humans in Varda films are substantial, thorny, complicated, real. Her films are classics because to can return to them and finds new things, always. By giving us fresh visions of humanity, she endorsed the human experience. You walk out of a Varda film and for a minute your persistence of vision gives you the world as she saw it, delightful and moving.